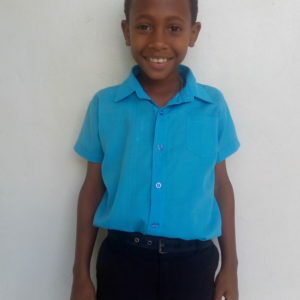 Antonio lives with his mother and 5 siblings in a humble house not far from Emanuel House. His home has a tin roof and concrete floor. His family must travel some to get clean drinking water. Antonio is raised by a single mother although sometimes his father and uncle help out around the house. It is not unusual for him to only eat one meal a day. Fortunately, Antonio’s mother is a believer and has a strong faith. Antonio loves to read and to read the Bible. He also enjoys playing baseball, going on walks, and going to the Emanuel House. His favorite color is blue.